As you enter the HORROR HOTEL, close the sun bleached curtains, step over to the T.V. that has seen the last century and get ready to experience 6 segments in this horror anthology directed by Ricky Hess. The film opens up with the story 'Aliens Stole My Boyfriend', a short that sees a young man get kicked out by his girlfriend for not being able to give her all she wants. Cue two blonde babes crash landing from space and in need of help. As the two space babes flirt away with the man his former girlfriend gets jealous and accidentally kills one of the aliens. With no hope of returning to her planet the only hope lies in the young man she has tried to seduce. Next up is 'Coma Girl' a seedy story of a maintenance man who enjoys the company of a woman who is in a coma. Unbeknownst to the husband his wife is actually pregnant and its all to do with that maintenance guy. A fight will ensue with only one person walking away with the girl. 'The Problem With Clones' is next and is by far the best story in my opinion in this anthology. A skip tracer is sent to bring a woman to court but he experiences a problem when he finds that the person he seeks is actually a clone. He does get to meet the clones in his search for the fugitive and each have their own unique characteristics. He knows the fugitive is nearby and he must get her to court on time. Stealing secrets is the aim for the next story entitled 'Brain Robbers In Love' which sees a book publisher wanting to find out what her more successful rival has in the pipeline. Paying a young woman who works at the rivals publishing house they swap brains in the hopes of stealing the rivals plans. Only thing is the girl who agreed to the swap has a secret that will only be revealed after the swap. A wheelchair bound hitman wheels in for the next story called 'Four Eyes'. His job is to take out a mans girlfriend but things never go quite to plan especially when money is involved. Last but not least came 'Life After Men'. The title says it all, but the story is about the world being extinct of men, and women rule with an agency keeping tabs on every woman in the world. When two girls go rogue when the system goes down they find things that are prohibited such as paper. Unfortunately for them the place they decide to hide out gets a surprise visit from two members of the agency and they can smell when a man is about. They may not be there for the girls but soon they will be confronted by the agency women and they aren't to be messed with. 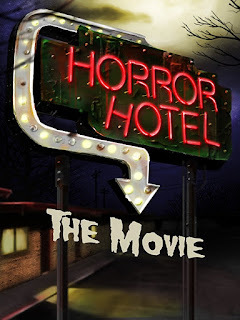 HORROR HOTEL brings together episodes of the HORROR HOTEL web series and pushed them in to this neat anthology film. Each segment is unique with great directing and settings. The occasional actor will appear in other segments as different characters which brings a whole new challenge for the actors but they do a great job. Special mention to the actress Baby Norman who gives each of her clone characters in 'The Problem With Clones' their own unique style. This was a great anthology film and like with all anthology films, if there is one story you don't like you don't have to wait long for a story to pop up that you like. Recommend watching for those who like campy fun films.